By Mohammed J. Zaki, May 27, 2014. We are pleased to announce the publication and availability of our textbook on data mining and data science. This textbook for senior undergraduate and graduate data mining courses provides a broad yet in-depth overview of data mining, integrating related concepts from machine learning and statistics. The main parts of the book include exploratory data analysis, pattern mining, clustering, and classification. The book lays the basic foundations of these tasks, and also covers cutting-edge topics such as kernel methods, high-dimensional data analysis, and complex graphs and networks. 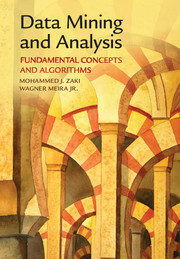 With its comprehensive coverage, algorithmic perspective, and wealth of examples, this book offers solid guidance in data mining for students, researchers, and practitioners alike.